Researchers from the Graphene Flagship have managed to increase the stability of perovskite solar cells (PSCs) using hybrids of graphene and molybdenum disulphide quantum dots. The team used molybdenum disulphide quantum dot/graphene hybrids to address PSCs' instability issue. The collaboration between research institutions and industrial partners enabled by Graphene Flagship, yielded an ink based on graphene and related materials (GRMs). Layering this over the PSCs caused them to drastically increase in stability. A joint research team including scientists from the Chinese Academy of Scinces (CAS), Shijiazhuang Tiedao University in China and Chiao Tung University in Taiwan has developed a novel type of highly flexible and stable perovskite-based solar cell that could be used in wearable electronics. The team stated that current PSCs are mainly made of a polymer substrate, which has been proven fragile, unstable and not adequately waterproof. The team built a new type of PSC based on an inorganic mica substrate, which could reduce the strain in the device even under large bending deformation. Mica is a mineral that separates easily into small flat transparent pieces of rock. A collaborative project undertaken by researchers from ICIQ’s Palomares and Vidal groups, the Physical Chemistry of Surfaces and Interfaces group at the Institut de Ciència de Materials de Barcelona (ICMAB-CSIC) and IMDEA Nanociencahave has examined the interfaces in perovskite solar cells to better understand the impact that changing the materials used in such cells has on its performance. This work sheds light on the reasons behind the differences observed in perovskite solar cells’ performance by comparing four different HTMs that present close chemical and physical properties. Researchers at EPFL, Led by Wolfgang Tress, have traced the origin of apparently high and even negative capacitance values observed in perovskite solar cells. 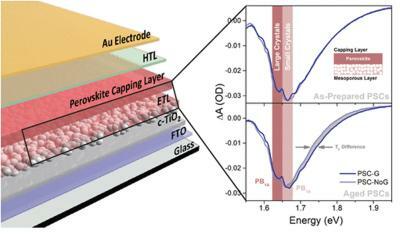 The team has found that the large perovskite capacitances are not classical capacitances in the sense of charge storage, but just appear as capacitances because of the cells’ slow response time. perovskite solar cells seem to hold great potential, with their highly efficient and low-cost; However, issues like weak long-term stability remain a challenge. Related to this are peculiar phenomena occurring in perovskite materials and devices, where very slow microscopic processes can cause a “memory effect” of sorts. Researchers from Peking University have conducted an experiment which is said to have demonstrated large-area perovskite solar cells are more stable 35 km up than at ground level. The researchers tested the stability of the devices by sending them to an altitude of 35 km above the Inner Mongolia autonomous region of China using an high-altitude balloon. The cells, which had an active area of 1 cm², were developed with a TiO2 mesoporous structure based on two mixed-cation perovskites, FA0.9Cs0.1PbI3 and FA0.81MA0.10Cs0.04PbI2.55Br0.40. “Moreover, different kinds of perovskite photoactive absorbers with and without UV filters were investigated”, the scientists said.